Makes battery charging through an on-board battery charger safer and more convenient. 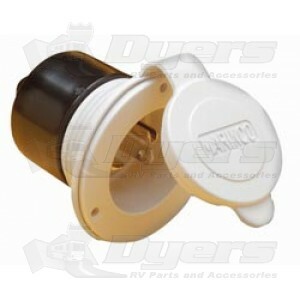 The inlet mounts almost anywhere on RV’s exterior and is hard wired directly to the charger. Just open the flip lid cover and plug an extension cord into the inlet to bring the charging power to the batteries. All of the hatches remain closed and locked throughout the charging cycle, adding convenience and security. UV resistant, low profile cap features perma-lock terminals and color-coded wire entrance holes make wiring a snap. 20A 125V straight blade inlet. Use with any standard 20A extension cord.